Okay. So I’m a tad embarrassed that there hasn’t been a new News post since the Pair-a-Thon last year. It’s a little awkward seeing them back to back, but that’s what happens when you can post news with every comic. Heh. Anyway! The 6th Pair-a-Thon has been going on, even if this post took over a month to post. But! Here’s your official rules post, and where you’ll find the links to the entries. I’ve decided to post everything at once this year–On the 10th!–to shake things up. So get that entry in while you still can! Thanks guys! And official rules are repeated for you below the cut. Good luck everyone! Mirrorverse and/or Genderbent Versions of the characters from sketch sessions are also fair game if you want. 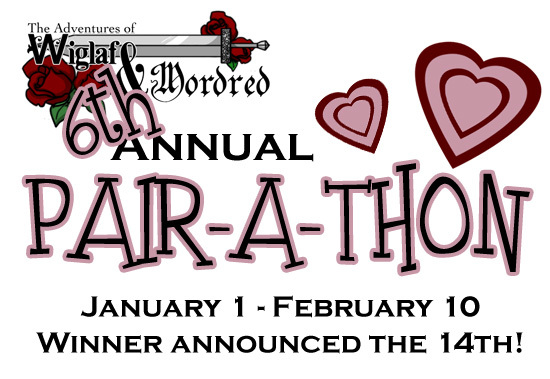 All entries must be in by February 10. At that point, a link to all entries will be posted on this blog post. On February 8 I’ll start accepting your votes for the winner! From February 11th to the 13th (10PM EST) I will be accepting votes via e-mail. More information when the voting process begins. Fanart and Fanfiction entries will be judged separately! So that means there’ll be a 1st & 2nd place in Fanart & a 1st & 2nd place in Fanfiction. 6. Pairings involving Hnæf or Safir MUST be rated G and platonic. They’re kids, folks. I’d rather not push my own luck around here, okay? However! I will make an exception if it takes place in the future and Hnæf is 18 years or older in your drawing. That is all.